Dual clutch transmission: Growing opportunity? – BG Products, Inc.
Dual clutch transmission: Growing opportunity? 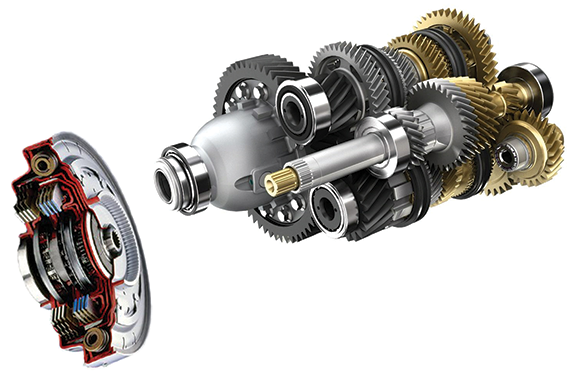 We are accustomed to two types of transmissions in all of our vehicles: manual or automatic. Manual is known for its strength and better MPG. Automatic is known for its ease and smooth operation. Today we hear more and more of a new kid on the streets that offers the best of both worlds: the dual clutch transmission (DCT). The trick of the dual clutch transmission is its ability to deliver power changes through a manual gearbox without shift-shock and torque-interruption, which are characteristic of a conventional manual transmission. The DCT’s lightning-fast gear changes keep power delivery constant while eliminating stall differential between the engine and the drive line. Basically, more of the power produced by the engine is transferred to the wheels, reducing the torque loss common to the automatic transmission. The DCT divides the transmission into two separate manual transmissions with two clutches, all contained in one housing. Operated in a fully automatic mode, the first clutch operates the outer transmission shaft containing the first, third and fifth gears, while the second clutch with its specific shaft, controls second and fourth gears. Clutch application for reverse can be specific to the design for each manufacturer. DCT may have either wet clutches or dry clutches. The wet clutch is the prevalent OEM choice because it allows for better cooling and handles higher torque ranges, such as in the Bugatti Veyron, which produces over 922 ft-lbs of torque. The dry clutch design is used for those vehicles producing a lower amount of torque, such as the Ford Fiesta. The global market for DCT is small (currently 3 percent) but may become the transmission of the future. Projected DCT North American share by OEMs shows Ford, GM and Volkswagen owning 76 percent of the DCT volume by 2017. The operational demands of a DCT will not allow for use of current transmission fluids. They are simply not suitable for DCT performance or protection. BG Products, Inc., recognizes the complexity of these DCT fluids and monitors current growth trends. Currently, BG does not have a product designed to address DCTs, but as the market expands, BG will be ready to serve the maintenance and expert technical support needs for these exciting advancements in transmission design.